Open-faced mock tuna salad made from garbanzo beans with vegan mayonnaise. For the vegan mayonnaise: In a blender, combine the soymilk, vinegar and pepper. Pulse until combined. Slowly add the oil, blending on high speed, until thick and creamy. Season to taste with salt. Reserve. For the tuna: In a food processor, pulse the garbanzo beans. In a medium bowl, combine the garbanzo beans, 3 tablespoons vegan mayonnaise, pickle, celery, red onion, cumin and pepper. Season to taste with salt. 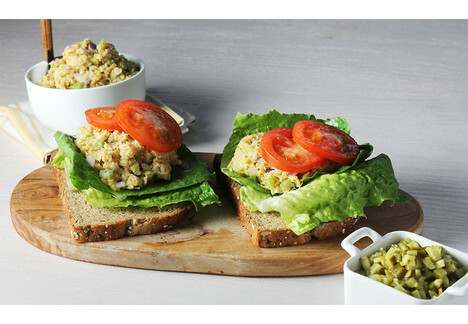 Evenly divide the lettuce onto each slice of bread, followed by tuna and tomatoes. Tip: Leftover vegan mayonnaise (approximately 9 tablespoons) will keep for one week in the refrigerator.